Tailwheel Training can make you a better pilot. Plus, it's a heck of a lot of fun! Come equipped to your tailwheel training with a real understanding of tailwheel operations and terminology and procedures and you can become a better better pilot. Oh, and did we mention that you'll probably save money as well, by being better prepared? Whether you're considering some tailwheel transition (endorsement) training, are already knee-deep in it, or already have the endorsement but could use a mental refresher, we can help. With material based both on the experiences of the CFIs and tailwheel pilots who are the authors of RideReady and specific FAA recommendations, our RideReady: Tailwheel Transition pilot will help you master the key things you need to know to fly a taildragger well and make the most of your training. RideReady contains hundreds of questions and answers designed to help certified "nosedragger" (tricycle gear) pilots get the tailwheel ratings. After all, the more you know before you go for your training, the more you can concentrate on the art of actually flying the thing! RideReady is very reasonably priced. If your experience is like that of most of our users, RideReady - Tailwheel Transition will easily pay for itself in terms of lesser training time. Plus, it features free lifetime updates, so you can always get the latest and greatest material to refresh your memory later on. RideReady contains more content than many books on tailwheel training and is packed with pictures and diagrams to help you on your way as well. But don't take our word for it you can download the demo version - free - below! So, please download it, see if it works on your PC, and whether or not you like it. If you do, you can get access to the full bank of information in only a few moments.
" I am a C-130 pilot for the United States Air Force and hold an FAA civilian commercial pilot certificate stemming back to my days flying my dad's Arrow. One weekend a fellow Herc pilot and I had nothing better to do, so we decided to get our tailwheel endorsents. Long story short, I ran into your [RideReady] Taiilwheel prep a few days before and decided to buy it. Truth be told, there's nothing in tailwheel flying that is that super complicated--however, there are a bunch of little things to get right! By using your product for a few days in advance, I was much better prepared than my friend (and beat him to solo by over two hours ha ha) because let me tell you -- that little PA-12 Supercruiser surprisingly kicked out butts! ... I felt I had a good handle on the theoretical aspects and so was able to concentrate on the flying and for this I am very grateful. I heartily recommend this to anybody who is thinking about tailwheel flying. " 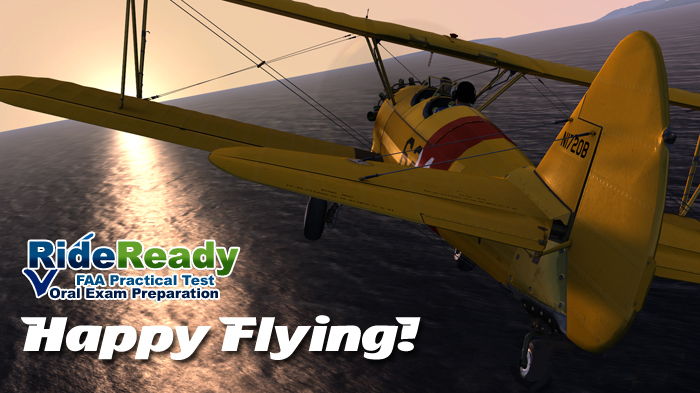 Thanks for checking out RideReady - Tailwheel Transition! 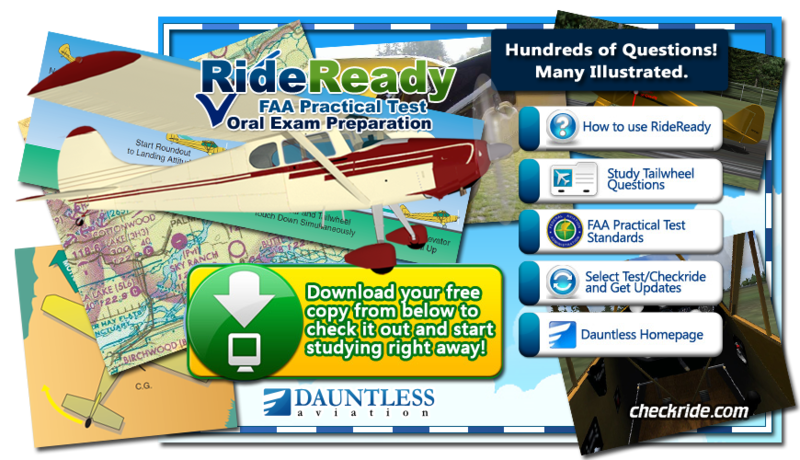 Our RideReady: Tailwheel Transition will, in an interactive question-answer presentation style, take you through the key knowledge points as determined by the FAA and experienced CFIs that are crucial for safe and effective tailwheel operation. You can be studying using RideReady: Tailwheel Transition in minutes - download the software and/or get the apps, and be studying immediately. Who is RideReady intended for? RideReady is primarily intended for certified airplane pilots who are interested in getting a tailwheel add-on endorsement. It is also useful for people who already have the endorsement but want to brush up on their knowledge and for those who are getting their initial Private Pilot certificate in a tailwheel aircraft. But there is no tailwheel endorsement "checkride!" This RideReady: Tailwheel Transition is a variant of our RideReady checkride (FAA Practical Test) preparation series. If you're like most people, your tailwheel instruction will involve only an instructor endorsement, not a formal FAA checkride. RideReady: Tailwheel Transition has been written with this in mind. The fact is that there still are many knowledge items that you need to know as you do your training and your instructor will not provide you with the endorsement until you master them - so, you might as well learn them with RideReady beforehand! Second, many tailwheel instructors do give a 'mock checkride', including an oral portion, before granting an endorsement, so for all practical purposes this is the same. You may wonder about the "question and answer" format then. Why is this better than simply reading the material in a book? Because reading a book is PASSIVE. You can just kind of nod your head and say "I understand" to yourself without really understanding the material. RideReady's question and answer format forces you (or at least, gives you every opportunity) to really formulate the answer yourself beforehand so that you can be sure you're not fooling yourself you understand something you really don't. Our system has worked for people for thousands of FAA checkrides and can work for you too in your tailwheel transition. When should I start studying for my tailwheel transition? Ideally, you should start studying as early in the training process as you can. Having more knowledge earlier on will help you make the most of your training flights and therefore likely save you training money / time over the course of your training. That said, RideReady is perfectly suitable for use while already knee-deep in training. I am training using a tailwheel aircraft for my initial Private Pilot certificate. Will RideReady help me? Yes, it sure will. However, you will probably also want to purchase the private pilot checkride version of RideReady, which covers more of the general knowledge areas required of private pilots. This RideReady: Tailwheel Transition title mainly focuses on the specific knowledge areas specific to tailwheel aircraft. Does RideReady cover everything that you need to know to fly a tailwheel aircraft? First of all, remember that RideReady: Tailwheel Transition is a transition prep. This means that for most part it assumes that you are already a tricycle gear pilot. The focust of RideReady: Tailwheel Transition is in teaching you things that are useful to know before you begin training. Things best left to your CFI are, well, left to your CFI. For example, we don't teach you how to hand-prop or the specifics of your particular on aircraft, which, in the world of taildraggers, might be very specific! The goal of RideReady is to provide you with just the right amount of background information to make your training useful. Unlike on FAA written tests where questions have obvious and definite answers, many oral questions are intended to probe your functional literacy and reasoning skills. Answers are often rich and detailed. Therefore, it is impractical to grade your answers strictly. Rather, RideReady leaves it up to you to see how your answer compares to ours. That said, RideReady allows you to flag questions as easy, neutral, or hard so that you can zero in on questions of importance to you. By the way, if you need a FAA written test prep , check out our GroundSchool FAA Knowledge Test Prep titles. Do I have to know ALL of the content of RideReady before taking my transition course? Generally speaking, the more you know, the better the likely outcome of your training. How much you learn from RideReady depends on you and your needs. Updates are always free, so, unlike limited-life span books, RideReady will serve you well into the future! There is an update link from the main menu. Click that, select the test you want, and follow the instructions to get the latest and greatest. Getting upgrades is integrated, fast and free. Thanks for checking out RideReady! Good luck in "Taming the Taildraggers", and blue skies!